+ Check HERE to get a sense of how the banners look in various worship settings. + Select the banner collection best suited to your worship context. + Download and complete the ORDER FORM. + When I receive your order, I’ll generate a PayPal invoice prompting your payment for the banner fabrics. + As soon as I receive your payment, I’ll place the order for your banner fabrics. 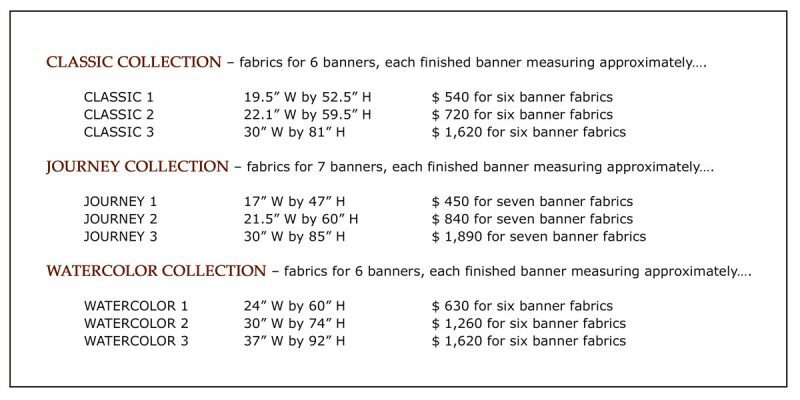 + The banner fabrics will be delivered directly to you in approximately four weeks. While you wait for your fabrics to arrive, you can imagine about how wonderful it will be for your faith community to celebrate each season of the Christian liturgical calendar with a beautiful banner!